You are human, so am I; embrace your dreams. Sometimes in life we put our fears in front of our dreams. We shut out anything that could help us strive and thrive to be all we’ve ever imagined ourselves being since we can barely remember. I know what you’re thinking and no I don’t want to be the fairy princess I did 12 years ago but I do still have dreams. We as humans tend to set aside our dreams and go for the more easily grasped lifestyle, we trade our dreams in and settle for less because we somehow talk ourselves down to be worth less than what we were intended to do. Now I don’t know about you but I’m pretty sure that if I was told 12 years ago that I couldn’t be a fairy princess when I was big I would have given up a long time ago but there were people that made my dream of being a fairy princess seem like it would be the mot wonderful thing ever. However as I grew older I quickly realized that being a fairy princess was something that I realistically could not live off of and financially provide for myself off of so my dreams switched. (I must add here that if you still want to be a fairy princess it is very much possible as a sweet friend who also has Gastroparesis, Chelsea yes you hi I’m talking about you and your lovely self! Chelsea is indeed a fairy princess, Tinkerbell *my favorite* to be exact as a job, so I guess all along everyone was right, being a fairy is indeed possible.) Now back to my point we as humans trade dreams and settle for less like I said. I’ve noticed this so many times in my life, I let go of what I’ve spent nights falling asleep dreaming about because someone told me I couldn’t, or provided another excuse. I’ve also learned very well though that dreams DO come true, you just have to fight hard enough for them. I think back to the last year of my life and all the little dreams that have happened in my life; escaping the hospital to go to a Bruno Mars concert for example (there was no way I was gonna miss out on Bruno because my head was attached to a robot, you better believe it friends I saw him in all his glory and yes he was lovely.) Now yes realistically speaking there are times in life when we are unable to do absolutely everything we set our minds to. There are setbacks in life, that’s why it is called life, life happens and things change and often tragic things happen and it isn’t until many years later we look back and realize the beauty that came out of the tragedy and sometimes we don’t ever see the beauty in that situation. This world is a crazy crazy place, and if I have learned that at all it’s been the past year of my life. I have sat wide awake in a hospital room alone at 3 in the morning as chemicals have been pushed through my body because I was unable to physically stabilize myself on my own. Until then I thought I understood all there was to life but I realized more than I ever have in life that night. I often have no control over where life takes me and when everything else seems gone at times there will always still be at least one thing to keep me going: my dreams. So as I lay in my own bed stabilizing my body on my own without being in the hospital attached to pumps I encourage you to not let go of your dreams. Don’t settle for less than you deserve. You have no idea what will happen next week, next year, next minute but you will always have your dreams. Use your dreams to keep you going because if we don’t have anything to dream for then we might as well just give up. Without dreams we settle for less and become content in the mellow when there is a world of exploring left to do. Your dreams are not stupid, you may have struggles that make things seem difficult at times but you my friend are not stupid, or silly, or dumb for having dreams. However you are silly if you don’t allow yourself the opportunity to achieve your dreams. Reach for the stars and until you’ve touched the moon don’t give up. When the going gets tough. Knowing the No. I’ve been teaching my body to stick out the pain and not turn immediately to my rescue drugs like I am so used to doing. I’ve gotten to the point in life where I will take a medication before I even feel the pain just in case I end up feeling it as then I will be safe; being scared of the pain is what my life has very quickly become. However over the past month I’ve realized that eventually my body will become prone to these medications and they will no longer work, it’s terrifying to think about the fact that your rescue drugs eventually won’t be rescue drugs anymore and you will be out of options. So in attempt to save my rescue drugs for the very worst of times I’ve been working on sticking out and enduring the pain without turning to medication. It seems silly as I type this because it’s so frustrating that a person even has to find themselves in this situation. I can’t help but think about the future and realize that in 2 years I will be on my own, to some it may seem far away but for others it’s something you must start preparing for. I’ve always had a lot of support around me whenever I’ve needed it; a hand to hold, a shoulder to cry on, a person to catch me when I fall (literally) but in 2 years all of this will change and I will be in the great big world on my own. It’s all so exciting to think about what my future will hold and who I will meet, what I will do, and where I will travel to but after rough nights the 2 years I have ahead of me seem almost impossible to grasp. I found myself last night in a room with my sweet sister, cousin, and mom all asleep as I layed wide awake with the too familiar dizziness running through my body. Realizing that in 2 years I won’t always have my mom or sister around to wake up in the middle of the night to tell I don’t feel good I realized there was no better time to prepare myself and take care of my body on my own. As I made the trek up the stairs into my grandmas kitchen my heart ran a marathon but the continuous “you can do this on your own you are strong” ran through my head. After stumbling into the kitchen to the fridge I quickly chugged a water bottle struggling to hydrate my body and swallowing salt from the shaker I grabbed all the crackers in sight and resorted to the couch. After catching my breath I realized that this was one of the more difficult flares my body has been thrown into but there not being a rescue medicine for situations like these I continued to tell myself that the shaking in my hands would stop eventually and my heart would settle leaving me in a position to finally fall asleep. After the ten minutes passed I was able to finally calm down, until I was awoken an hour later by the oh so familiar tumbling and twisting of my stomach. At this point I was beyond frustrated, I had already dealt with my POTS for the day the last thing I needed was for my GP to act up. After sitting on the bathroom floor all I could think about was how much easier things would be if I just gave in and let it all consume me. After all fighting pain is a very exhausting thing to do. I thought about how much easier it would be to just give in and use the medicines until they no longer worked, to just throw the health I have away and not eat because maybe then I would feel better (which definitely would not work as I would end up tube fed). I eventually fell asleep on the couch to wake up the next morning. As I prepared myself for another day I realized that I didn’t eat a good dinner last night, I jipped my body from getting the nutrition it needed (probably what caused my POTS flare) and the unhealthy not so nutritious dinner I had most likely was what sent me into a GP flare. All of this is just a reminder of the fact that I have to take the absolute best care of myself I possibly can. Bow obviously that goes for anyone but in the hot heat I was out in yesterday I probably should have drank more water and even though I did drink a lot it wouldn’t have hurt to drink a little more. I also probably should have eaten a healthier dinner that would provide my body the necessary nutrition and energy I needed after such a long day. I have to start training myself to take better care of my body and be more aware of such things. I think this can be placed in the daily lives of many wether you are someone who gets up early for work and should probably go to bed an hour earlier than they do or someone with fair skin who should put on more sunscreen or the friend at the party who should really consume one less drink (or maybe not at all). We as humans tend to look past the fact that we really only have this life and aimlessly living it without protecting our bodies can do us a lot of harm. I found myself today at a blue man group performance in a rather down mood. I was sad that I had to get pulled out of the show at 3 different times for the prevention of strobes (they make me seize) and I was bummed and felt left out because my medical situations had restricted me from doing something. Yes I could have sat through the strobes and yes I would have had a seizure but then my body would have been unable to keep up with everyone else’s for the rest of the day. I realized later that protecting myself is often something I need to do even though it may not seem like the most fun or exciting option. This doesn’t mean I have to live in a bubble in my bed all day it just means I have to take things as they come and in that time and that moment make the smartest 9and safest) decision for me as a human. By protecting what I have now I am giving myself the opportunity to later take life and run with it. So I might not be the kid going to amusement parks or out partying on my summer nights but I am the kid thinking and doing what’s best and healthiest and that’s something that’s very hard to do. I would like to sit through strobes and dance around too but the reality is that I can’t, I would like to eat ice cream with all the milk in the world but the reality is that I can’t, and sometimes that is hard to understand and get past all of the no’s to embrace the yes’ but it takes time and that is okay. I guess the point or intention of this blog post was the fact that we as humans don’t respect ourselves as much as we should sometimes! I encourage and challenge you to find or consider doing what’s best for you rather than what you want the next time you are placed in a difficult decision or situation to make. No isn’t always what I want to hear and that’s something I am going to have to work at but if I intend on staying in this body of mine No is going to have to be the okay sometimes. I’ve always struggled with finding the line between introducing myself to people, letting them into my life to know who I truly am and then leaning on them for support but also giving it back. It’s hard to understand and draw the line between a friendship and them being your psychologist (not really but think of it that way for this post). As anyone in life struggles occur eventually leaving us with a life story to tell; your personal experience fighting your battles understanding who you really are, and learning to love who you are. I personally struggle finding the balance between understanding that I’m sick and at this point and time in my life it has an effect on me but also understanding that I am still the very same Merideth I was when I was born 16 years ago. It seems very foreign to me nowadays when people call me Merideth as I sometimes do a double take because so much of my life has changed that it sometimes seems I am nowhere near the Merideth I was for the previous 14 years of my life before becoming sick. Like I say all the time you might not be sick, we all have struggles and they all present themselves in different ways. 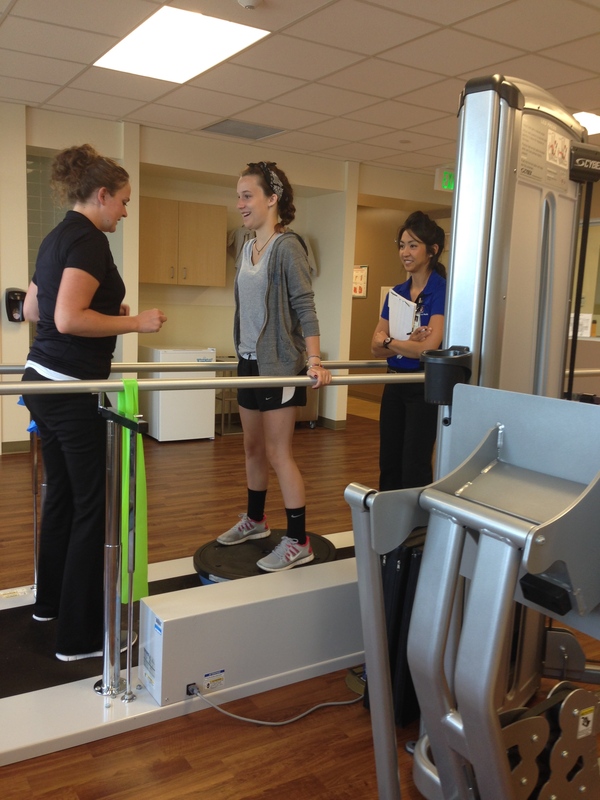 The other day at physical therapy it was decided we would work on strengthening my balance. I quickly thought in my head why do I need to work on this I have perfectly fine balance I can walk in a straight line, stand on one foot I’m perfectly fine! I must have jinxed myself though because after stepping on the contraption I realized almost immediately that the balance I once had from years of cheerleading was almost completely gone. It wasn’t until after my appointment when I looked at the pictures my mom had taken that I realized I was looking at the answer to so many of my problems. You see in life we struggle almost daily to find our balance maybe not physically (well for y’all but clearly me) but definitely mentally and emotionally. So paint this picture in your head you wake up and start your day on a balance beam, as you go through your day you do multiple “flips” on the beam the good ones you land but the sloppy ones you fall off the beam and eventually have to get back on it and go again. However after a while you take so many falls that you no longer have the strength to get back up and must be done for the day. You see this is very much like our everyday lives we make decisions to fall back into bad habits, we say negative things, we doubt others, etc. all of these things push us off the balance beam and distract us from getting back on. The good things how ever give us confidence they make us stronger and eventually lead us to accomplishing more. Now granted I wasn’t on a balance beam at physical therapy (that would be a disaster) but I was on a similar contraption. I in life often make these sloppy “flips” on my balance beam; I let the negative parts of my illness get to me, I wallow in the pain, and I feel sorry for myself. Some days I make more sloppy “flips” than others and I get so into a routine of making them that I will have a week that feels as if it has been completely worthless and just much better spent alone in my bed. BUT when I eat healthy, encourage myself, surround myself with positive influences, push a little more I land these “flips”, I become stronger and more confident in myself. It can often times be very hard to find that balance that allows you to land the “flips” and gives you the strength and confidence to do them. It’s so much easier to not attempt to make the most out of my day, to just lay on the balance beam and not even try but I find when I do that I am the most miserable, my mind gets flooded with all the bad things that have occurred and it feels impossible to stand up on my beam and land my flips. It’s hard to surround yourself with people that will be able to share their life stories and experience to give you the confidence to continue to wake up every morning and jump on your beam but when you do you feel such power. I can definitely say that in the last month of my life my view on how I’ve chosen to live it has changed so much. I’ve begun to truly understand that not everything that happens in my life will be in my favor or in my control but that’s just life and I have to be patient. I have learned that sometimes you are so burnt out that all that’s left is half a smile but that half a smile is so much more than a frown because there is still hope in half a smile. I have learned that it will take time to find my balance and reach the point where I no longer have to hold onto the side rails to hold myself up tall, that it will come naturally it will just take patience and hard work. I encourage you to try and find your balance, to challenge yourself, step out of your comfort zone, and wake up every morning with an attempt to stand tall on your beam with your head held high and the best half smile you have ever worn on your face.